“There is something on the front porch that you should see. She has a lot of stories to tell.” I go out on the front porch, the place where I had a vision 30 years before of all the women in the world, living and dead, dancing and singing in a circle. At this moment in the dream, I also realize that there has been a smaller version of the statue inside the house for many years. So the idea is not startling. This stone statue is enormous, magnificent. Beautifully carved. The head of a lion, paws pointed toward the street and the hills, sitting. Her body is a combination of a woman, with breasts, and the body of a lion. Behind each ear is a huge red hibiscus. It is clear she is powerful, feminine, passionate and a lover of beauty. Although I think at first “sphinx”, remembering the Egyptian stories of the sphinx is full of stories, secrets and mysteries. But then I realize this is not a sphinx but the Egyptian goddess Sekhmet. Because the statue is lying down, I cannot see if she has the wings of an eagle like the original Egyptian goddess. But it is clear she is Sekhmet. 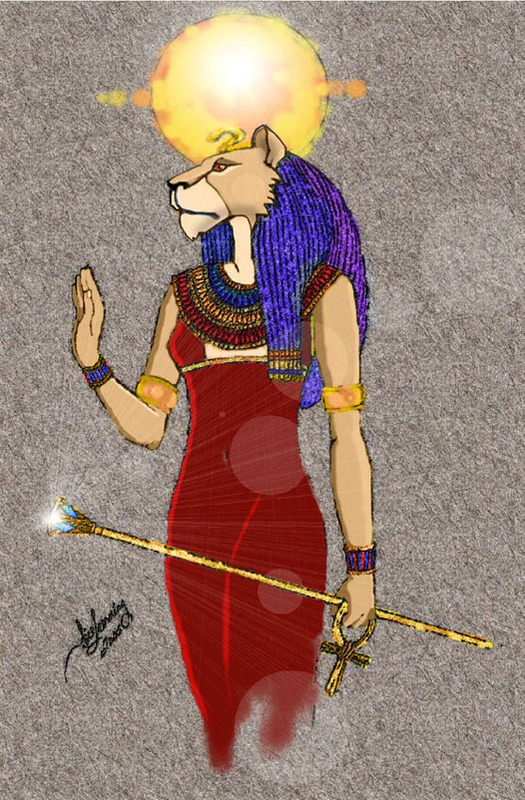 Older than Ra, Sekhmet is a lion headed solar goddess. “She came to Egypt from a place unknown and a time unrecorded.” She is known as Lady of the Place at the Beginning of Time. One Who Was Before the Gods were. Strong, mighty, powerful, she is related to Shakti, the feminine energy of Kundalini and the chakras. She is a great healer, The Great One of Healing. She is called desert, flame or Flaming One. A twin to the Egyptian moon goddess, Bast, Sekhmet is the older sister, the aspect of magic and power. As a goddess of both creation and destruction, this elder goddess wisely chooses what to create and what to destroy. Sekhmet represents the powerful time of self-creation and self government that can produce visions and create magic. An association with the snake, symbol of transformation, connects Sekhmet to the healing, visionary and shamanic capacities of the High Priestess. In this dream, we have an image of feminine power which I ready to come into the world and show herself. This is a time for women to use her self will and creativity for her own benefit, and to benefit the world. Her power is transformative. Ruler of the House of Aries with the Element of Fire – A Warrior Goddess – with courage, strength, individual willpower. The sun, fire, blood, wilderness, the desert, snake, lion, heat, healing. The power to manifest of the third chakra. These are her gifts, especially for the woman past menopause. The woman wise in her prime. Primetime Woman. She is a guardian of the world against evil. The kind of evil which just recently, again, saw a massacre of young children by a mentally ill man armed with an assault weapon, a weapon of war. We must address and dispel our fears and misconceptions of feminine power so that we may express and act with our power, our authority, our wisdom, to transform the world.